Octo Mounts F-Mount is works as a filmmaker/camera grip, tripod mount or traveler stand for holding your device more ergonomically and securely. Your phone will be kept safe and held tightly thanks to the adjustable pressure-screw and thick rubber pads. UNIVERSAL COMPATIBILITY - The F-Mount holds virtually all smartphone models including iPhone and iPhone Plus sizes, Samsung Galaxy, Sony, Android, Nokia, etc. It works with any device with a width between 48mm and 95mm. FEATURES: Tripod Mount with Cold Shoe Mount. You can mount your smartphone on any tripod with a universal 1/4"-20 thread screw, or mount it on a slider or shoulder rig for taking steady shots and video. LED video light or microphone can be attached on the cold shoe mount. 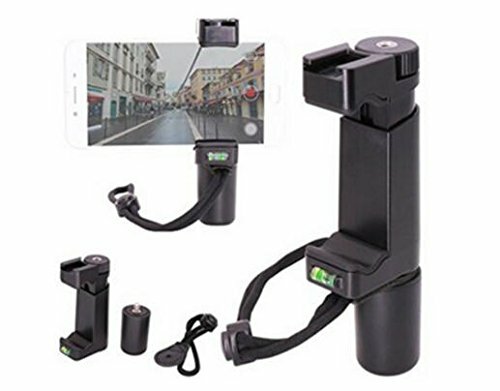 FILMMAKER HANDLE AND CAMERA GRIP - Fix the F-Mount to the right side of your smartphone for holding your device more ergonomically, add the wrist strap (included) for maximum security, and turn your mobile device into professional filming equipment. TRAVELER STAND - It can stand on its own, so you can hold your smartphone steady even when you don't have a tripod. Mount the grip at the center of your device for Landscape mode or slide it sideways for Portrait mode. Take great night shots, shoot time-lapse movies on the go, livestream, video blog or edit your pictures comfortably. • COMFORTABLE AND SECURE - Use it as a filmmaker/camera grip, tripod mount, or traveler stand for holding your smartphone camera comfortably and safely. • ADJUSTABLE - compatible with virtually any smartphone model - Works with all iPhone and iPhone Plus sizes, Samsung Galaxy S7, Sony, Nokia, Lumia, Nexus or any device between 48mm and 95mm wide. • FEATURES - Tripod Mount with Cold Shoe Mount. Mount you smartphone on a tripod using the ¼" screw or mount it on a slider or shoulder rig for taking steady video. • PERFECT FOR ON-THE-GO - Ergonomically designed and sized just right for on-the-go pictures, video recording, selfies, Face-Timing or recording. If you have any questions about this product by Octo Mounts, contact us by completing and submitting the form below. If you are looking for a specif part number, please include it with your message.